For starters we should put this out there: we can’t answer the question above for you. Only your team knows where you’re at when it comes to bringing in new donors and managing current contacts. Only your team can assess whether or not a CRM tool is worth its weight in gold. What we can do is point you to the right questions and help you understand the functionalities of a CRM so you can make an informed decision. In a nutshell, a CRM allows your nonprofit team to automatically send out messages to your contacts as well as keeps track of each contact’s history with your nonprofit. With this setup, it can do a lot of your day-to-day outreach tasks for you and consolidate many of your current tools. This might include but isn’t limited to email marketing, social media, blog analytics and contact record maintenance. We compiled some questions we ask nonprofit clients as well as questions Marketo asks in their marketing automation assessment test. 1. Are you able to track and engage with individual donors, volunteers and general website viewers online? Do you have so many contacts or potential contacts that you can’t manage this? If you find that you are not able to develop a more concrete relationship with the folks that engage with you online—i.e. they read your newsletter, comment on the blog or share a social post—you are likely missing opportunities to cultivate more avid followers of your nonprofit. They clearly have an interest in your nonprofit, but if you’re not sending them specialized emails or the like to take them to the next level, they’ll likely stay where they are. A marketing automation platform allows you to set up workflows and alerts for your website viewers. If it detects someone has been on your site frequently, you could trigger an alert to reach out to them. If someone fills out a form on your site and goes on to open the next two emails from that workflow, it could send them to a new workflow with more in-depth content. All of this happens behind the scenes, while you work on other tasks! 2. Are you able to prioritize each contact based on their engagement with your nonprofit? Besides just automated workflows and triggers, marketing automation software scores your contacts. So the more engaged they are on your site and with your emails/social etc., the higher their ranking. When you need to know who is most likely to donate or volunteer, you’d be able to reach out to just those folks, instead of risking overstepping your bounds for the less-engaged individuals. This both saves you time filtering through contacts and allows you to talk to your contacts in a more appropriate manner. 3. Are you able to measure the ROI of every marketing campaign you have run? Are you trying to better understand how each channel interacts? Rather than handling social media on Hootsuite, email marketing in MailChimp and your blog in WordPress, a CRM allows you to do this all in one spot. In consolidating these platforms, you not only save time on moving from one system to the other, you can also better track your campaigns. CRMs typically report on all your outreach campaigns in one place so you can see how each is impacting the other and where you should be putting your budget. 4. Do you have a ton of content on your site? If you have been posting on your blog pretty regularly, you may be ready to advance your efforts. Likewise, if you are looking to publish more landing pages, it’s much more manageable within a CRM. You can group your content into campaigns, attach calls to action, create content offers and more. You can also schedule out posts and pages for future publishing dates; this can be especially helpful during giving season so you aren’t going in and publishing when your time is limited. 5. Have you considered hiring another team member to help manage your content and leads? When your nonprofit is looking to expand, a common tendency is to hire new employees. This is great and can be just what you need, but in some cases, an automation platform can actually help you manage the tasks with which you’re seeking assistance. 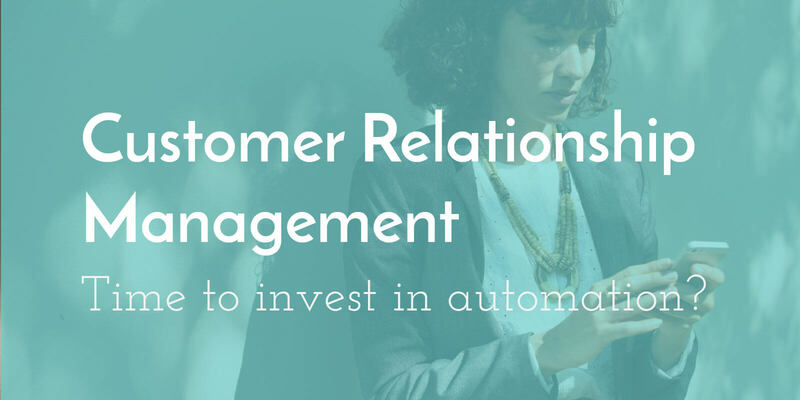 If a lot of your donor management and communications becomes automated, it takes some of those responsibilities off your teams’ plates and frees you up for other work. The cost of a platform can be high, but it’s far less expensive than the cost of another employee. 6. Is your team on board to adopt yet another system? If your team isn’t ready to learn yet another system and doesn’t feel like it’s necessary, don’t commit to a CRM. Everyone working in this area needs to know how the system works and use it to its fullest. If not, contacts get lost, the system gets messy and the monthly subscription fee is not worth it. If you know a marketing platform is necessary, and you just have to work with your cynical team members, read this post on how to encourage them to adopt the new system. 7. Do you have the budget? This is often the first question people ask when looking into their need for marketing automation. We encourage you to actually save it for last. It’s evident in the questions above, but when you think through this decision, so much of the expense of a platform is reduced in terms of the time and effort it saves you otherwise. What’s more, if it cultivates donor relationships for you, this potential profit should be taken into account. Once you have this in mind, know that a full on CRM can cost up to $800+ a month, if not more, depending on how many contacts you have. If you’re reviewing different software providers, be sure to ask for their nonprofit rate as many of them have a reduced price. Ready to look at your CRM options? If the above questions convinced you it might be time to at least look at your options, use our comparison chart. If you need guidance from a team who has worked with nonprofits and several of these CRMs, reach out to our team at ArcStone so we can help you find the best fit for you.